A quality mattress means the difference between getting a deep sleep or tossing in bed all night long. Well-constructed mattresses help to prevent insomnia and back problems. But getting a high-quality mattress is just half the battle. You also need to invest in a great box spring, which provides support for the mattress. In addition to support, box springs also elevate the mattress, making it easy to climb in and out of bed. Ideally, one needs to place the box spring on top of a bed frame, which connects to the headboard and footboard. You can even use the box spring and mattress together without the complete bed set. This article describes the best box spring products that are available for purchase along with their pros/cons. After reading this article, I recommend you take a look at the mattress buying guide and the pillow buying guide so you can complete your bed set. What’s the ‘Best Box Spring’ on the market? 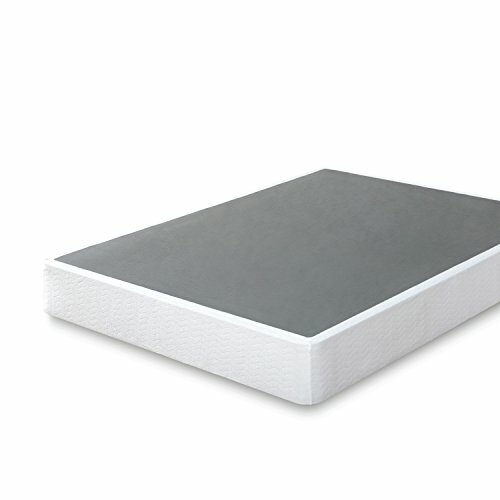 The Zinus Smart box spring features a solid steel construction. It has a high-profile design and measures nine inches in height. While Zinus maintains the look of a traditional box spring, its steel structure makes it incredibly durable. This box spring requires very little assembly once you purchase it. Thankfully, the manufacturer provides all the tools you’ll need for this chore. But, if you can find an extra pair of hands to help, that will be even better. 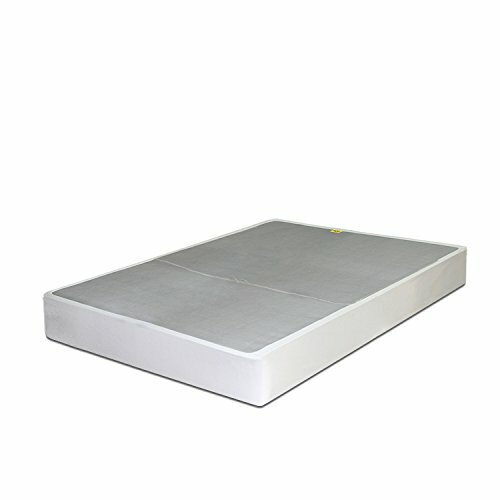 Zinus Smart Box Spring is well-suited for use with all kinds of mattresses; be it, full, king, queen or the twin-sized mattress. Zinus box spring has a maximum weight capacity of 2400 pounds. Even if you factor in the weight of a heavy latex mattress, you’ll still have about a ton of capacity left. It means that you, your partners, your kids and pets can all crawl onto this mattress foundation without compromising its quality. One thing that sets the Zinus box spring apart is its packaging. Its neat packaging makes it even easier to assemble as you can see all the components that you need to piece together. This is the reason we think it deserves to to be called the best box spring out there – with easy installation, great customer service, and plenty of capacity. The manufacturer provides a five-year warranty for this box spring. As such, you don’t have to worry much if your mattress comes with some kind of defect. You can simply make a warranty claim and get a brand new one. If you have a tight budget, this eight-inch box spring by Classic Brands is a great choice. We think this is the runner-up to the best box spring listed above. Constructed from premium-quality spruce, this box spring is capable of supporting your mattress; and hence preventing it from sagging. Assembling this mattress foundation is a snap, and it will take you about twenty minutes. All you need to do is to unpack all the pieces, assemble the frames then attach the hardware elements. Once the frame is set, all that’s left is to attach the wooden slats and your box spring is ready for use. In case you get stuck, you can always refer to the manual that the manufacturer has provided. As for compatibility, Classic Brands alleges that the box spring works well with memory foam, Latex, Hybrid and Innerspring mattresses. What’s more, the existence of the wooden slats and cover make the foundation rock solid, enabling it support your mattress. While the Zinus is extremely easy to assemble and has a great customer experience, this classic brands box spring has minimal squeakiness/noise. This is why we think it’s a great #2 to the best box spring. Spinal Solution’s box spring is an interesting competitor in our ‘ best box spring ‘ run down. This is one of those companies that strives to make the finest quality box springs and mattresses. Based in USA, this firm always tries to satisfy customers’ needs to the fullest. Their Split Box Spring is a perfect example of this company’s craftsmanship. Firstly, it comes fully assembled. With most box springs, you have to take a gamble on whether the furniture will fit through your hallway or staircase. But this is not the case with this box spring. It has a split design, allowing you to fold it in half. As such, carrying it through narrow doorways and stairs is a breeze. Its structure also makes it easy to store in case you have a small apartment and you wish to save on space. The Spinal Solution box spring is versatile. You can place it on a bed frame or the floor. The only thing you should be cautious about is the amount of weight that you put on it. Its maximum weight capacity is 500 pounds, which is a little less than other box springs on our review. I think the split design leads to this lower total-weight rating. Spinal Solution uses light and dense lumber in making this box spring. This material is good enough to prevent the box spring from loosening up and cracking. On the flipside, the manufacturer provides just one-year warranty. It means that if any defects crop up after the first twelve months, you are not legible for any replacement or repairs by the manufacturer. With the moving parts (split design) and the low weight-limit, I get worried having just a 1 year warranty. This is why I didn’t rate this among the top two best box spring sets available. 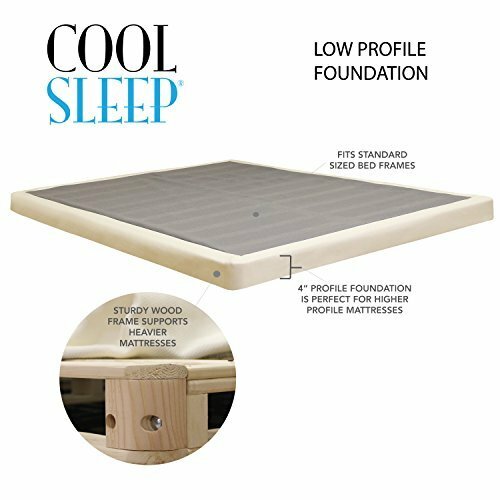 The Low Profile box spring by Lifetime Sleep Products is one of the best box spring bases on the market. The manufacturer boasts a quick assembly that will take you less than fifteen minutes. What’s more, should anything go wrong with your new box spring, you can make a warranty claim given that manufacturer provides a lifetime guarantee. This amazing product support is why we rank this among the top box springs available. Being low-profile, this box spring is four inches in height. Cutting a few inches off this platform helps to reduce the height of the sleeping surface and makes it easy to get in and out of bed. Although many view this as a detriment, this height is perfect for toddlers, who are just getting accustomed to using beds. It’s also convenient for the elderly and other persons, who experience difficulty moving around. And the few inches that are removed don’t really have an effect on how much dirt gets onto your mattress. Also, the fact that this box spring sits low enables it to create the illusion of more space in a room. So, if you have a small bedroom that looks a bit cramped, the Lifetime box spring can help with that. Perhaps the best feature of the Lifetime box spring is the free shipping that the manufacturer provides. That’s right; the company ships the product to your doorstep at no extra cost! For a budget consumer, the additional shipping cost could make or break a purchase deal. The one thing that the modern-day apartments are missing is ample space. If you are struggling with this and still looking for the best box spring solution, you should consider investing in the “Best Price” box spring. It’s capable of supporting your mattress better than any traditional frames, and it eliminates the need for buying a complete bed. 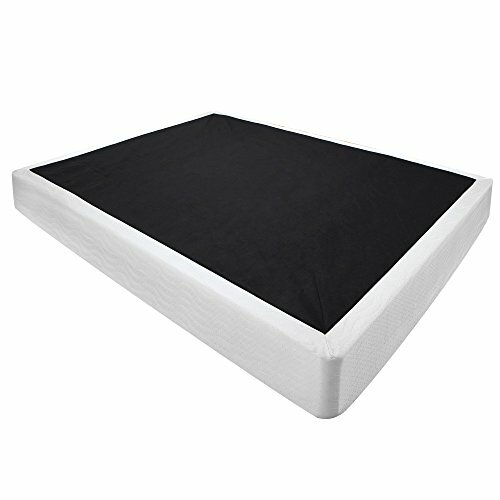 This steel-made box spring can support all types of mattresses including memory foam and inner press mattresses. 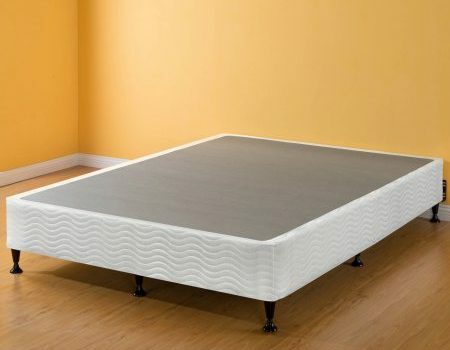 In addition to its sturdy build, the box spring features a non-skid cover, which keeps the mattress in place. One admirable aspect about the “Best Price” Box Spring is its easy assembly. You can assemble this item in minutes since it does not require any sophisticated procedures or equipment. Although, this isn’t much of a differentiater compared to other box springs that we have listed in this guide. The majority of reviews regarding this product have been positive. Most users commend it for the easy assembly. They also acknowledge the high tensile strength provided by the steel construction. The fact that it’s cheaper than most high-end box springs on the market is another plus. Yes, this box spring lacks a full size bed frame with a headboard, but it’s much cheaper! Overall, this is a great box spring for its price. Assembling it alone can be a bit tedious. Get some help! Box springs protect your mattresses from dirt and stains. Some even have a low profile design so that it’s easy to get in and out of bed. This benefit is what makes them a popular choice among the elderly and those encountering mobility problems. Most people also buy box springs because they provide support for the mattress. 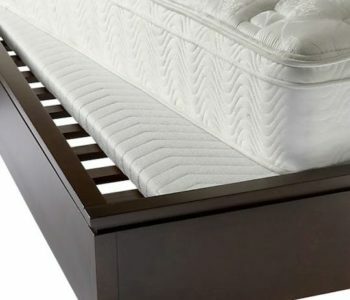 The good thing about this list of best box spring platforms is that most of these foundations are compatible with an array of mattresses whether it’s a memory foam or heavy-duty latex. If you’re looking to purchase a box spring for your mattress, consider these models: Zinus 9-inch High Profile, Classic Brands High Profile, Spinal Solution Split Box, the 4-inch Low Profile by Lifetime Sleep Products and Best Price box spring. We’re sure you’ll enjoy it. And, if you need help with your mattress or pillow selection, perhaps you can take a look at our Zinus Green Tea guide and our guide to the best memory foam pillows.